Here's the black sheep of the family! John's ewes are lambing so there's lots of baby lambs running around. The guys added on to the hoop barn so there's more room for calving heifers. The calves have a place to stay in for several days then they get turned out in a smaller pen with a calf shelter to go in if needed. Pictures from my walk the other day. It was a warm day, and the breeze was at my back so it was a nice walk. Lots of snow last week but no wind so that was a good thing. I made this pillow for the cutest little girl:) Her initials are A L T so I wanted a brand for her I had some ideas but then asked Greg to draw up some and this one is his. Here she is! Those cheeks:) I bet they get kissed by the hundreds! A few years ago I made this one. Who knows maybe these 2 will meet up someday! Kolt sleeps with his pillow! I will always cherish his pillow and quilt from you! 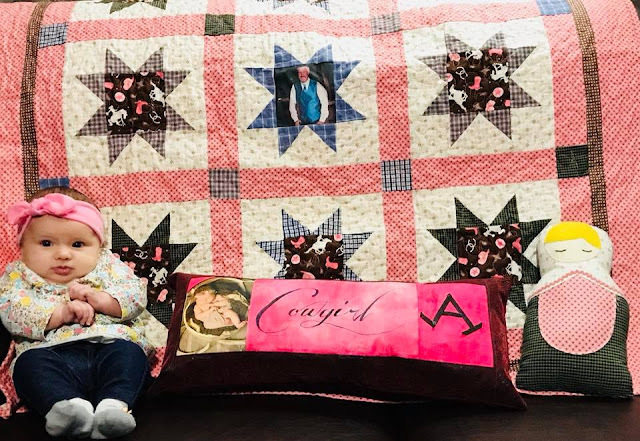 That is a precious baby - with her quilt and pillow. So cute! Love your animal pictures. Even though it’s very hard work, I wish I lived on a farm. Farmers are wonderful and as important as our military. Great pictures and a cute pillow. What gorgeous scenery. It must be an awesome place for inspiration. Lucky you. Please keep showing us animal photos. I love the pocket pillow. What a great idea! I, also, enjoyed all the pictures. Since we haven't had much of a winter, it was nice to see the snow. There were so many delightful things to look at in your blog. That baby pillow is darling! You gave me ideas for my newest grandson's quilt. I already had cowboy fabric that I was going to use, but I like the picture(s) on Kody's quilt. I would love to go on a walk with you, the scenery and animals would be wonderful to see. Your pictures are just beautiful! I have an online stitching friend whose goats are kidding right now and I just love when she shares her pictures too! 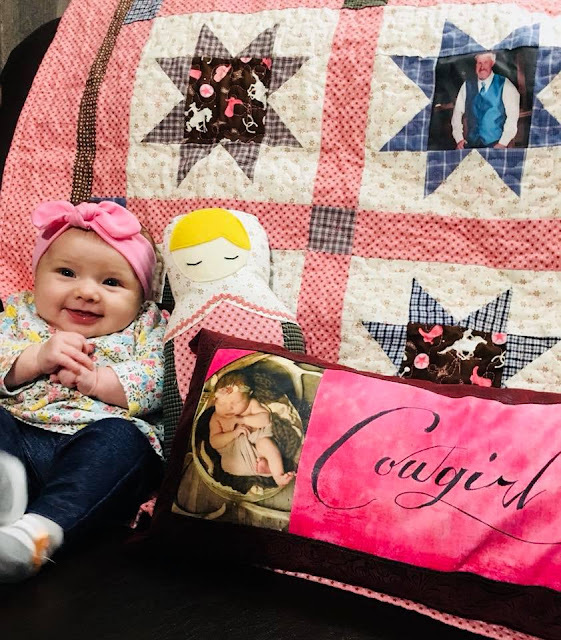 That pillow is just the sweetest, and I love the picture of her with the pillow and the quilt! Absolutely precious! And the brand... so neat! What a lovely mix of beautiful of photos. The cushion is beautiful, how nice to see it with it's owner. Thanks so much for joining is at Handmade Monday.